The New Golden Mile is the name given to the area of land which lies between San Pedro de Alcantara and the Eastern part of Estepona on the Costa del Sol, connecting both Marbella and Estepona towns. The main coastal highway runs along this stretch, and divides the New Golden Mile into two distinct parts. The Northern side which encompasses some small towns, villages and urbanizations and is popular for its lower land prices with plenty of small shops, supermarkets, eateries and cheaper developments, whilst the Southern, beach side offers a more upmarket buyer access to luxury real estate, with sq. metre prices for land being up to triple those on the North. 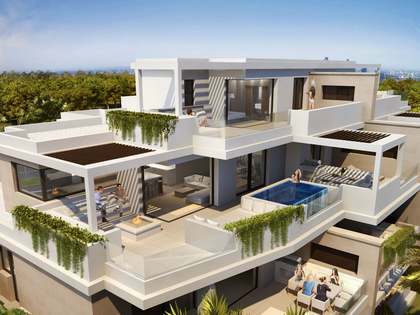 Belonging to the Municipality of Estepona, the New Golden Mile has undergone significant development in the last couple of decades and its beachside developments are now the first choice for people seeking luxury properties. Unlike Marbella´s Golden Mile, which is consolidated with little or no space for new development, this area has plenty of scope for smart new architecture, high quality builds and is home to the most prestigious villas for sale; all with stunning views on great beachfront locations. Thanks to the positive way in which the Town Hall of Estepona has planned expansion throughout the area, this could be considered to be the "real" Golden Mile. As well as economically different, the area is geographically distinct, the area north of the road is slopes slowly upwards towards the foot of the local Sierra Mountains giving those who do not mind being further from the coast, the chance of sea views, whilst the Southern beach side of the road offers a short stroll to the shore and sandy beaches. The unspoilt beaches in this area are always less busy than their Marbella counterparts giving a feeling of privacy and solitude. The New Golden Mile appeals differently to different buyers so one should be well aware of this when searching. Some amazing developments, such as the frontline beach Emare project offer luxury that is hard to compare. For those on a more limited budget, the North side of the highway can be a great option, with a wide range of properties from apartments to Villas. As the properties for sale in New Golden Mile are built in attractive contemporary complexes they appeal to different nationalities and for those looking to settle with children, there are some great and highly sought after International Schools in the area. The New Golden Mile is well established as an area for luxury leisure and relaxation. There are a number of top class hotels in the area. An urbanization of special mention is Los Flamingos Golf and Country Club. This is an exclusive gated luxury urbanization with a spectacular golf course and facilities, high end developments and fantastic easy access to the beach. It also boasts its own 5 star Hotel, Villa Padierna. Laguna Village, is an exclusive high-end spot, which boasts three relaxing themed beach clubs, Claro!, Camuri and the internationally renowned, exclusive Puro Beach. These great clubs add to the elegant, laidback lifestyle predominant in the area - letting you enjoy the fine sandy beaches whilst chilling out in luxury. With great food and wine, this is a luxurious way to spend the day. This part of the Costa del Sol offers an all year round outdoor life which can be enjoyed to the full by residents and visitors to the area. There are tennis clubs, an Equestrian centre and Selwo Adventure Park, a major local wildlife attraction - great for families to enjoy. Selwo, built on the North of the highway, is easily reached and busy most of the year with visitors. For lovers of watersports there are a variety to choose – from exclusive Jetskis to Paddle Boarding. 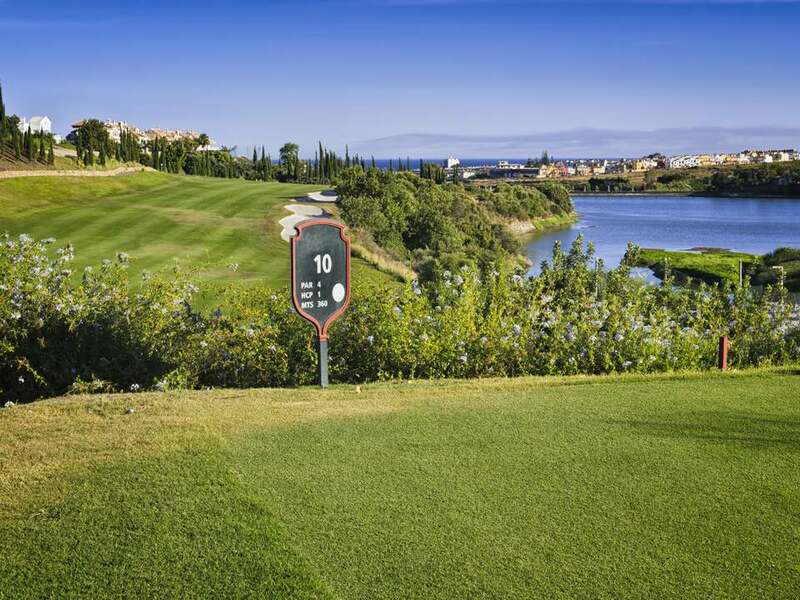 For golfers, a plenty of golf courses are available, including the aforementioned impeccable Los Flamingos Golf and Country Club, to the popular everyman El Paraiso, and the well cured greens of Atalaya, to mention just a few. The New Golden Mile is easy to get to, being only 40 minutes away from either Malaga or Gibraltar Airports, 15 minutes from Marbella and going east from Estepona, a beautiful and extremely popular coastal town. Lucas Fox can help you find the perfect property for Sale on the New Golden Mile.